This year, University of Kansas researcher Jeffrey A. Hall helped demystify the process of friendship-building in a study published in the Journal of Social and Personal Relationships. It’s the first to explore how many hours it takes for an acquaintance to become a friend. Hall surveyed 112 college students every three weeks during their first nine weeks at a Midwestern university. He also gave a one-time questionnaire to 355 American adults who had moved to a new city in the past six months. In these surveys, the newcomers picked a friend or two and reported how much time they spent together and how close the friendship became. It took students 43 hours and adults 94 hours to turn acquaintances into casual friends. Students needed 57 hours to transition from casual friends to friends. Adults needed, on average, 164 hours. For students, friends became good or best friends after about 119 hours. Adults needed an added 100 hours to make that happen. …As external conditions change, it becomes tougher to meet the three conditions that sociologists since the 1950s have considered crucial to making close friends: proximity; repeated, unplanned interactions; and a setting that encourages people to let their guard down and confide in each other, said Rebecca G. Adams, a professor of sociology and gerontology at the University of North Carolina at Greensboro. This is why so many people meet their lifelong friends in college, she added. 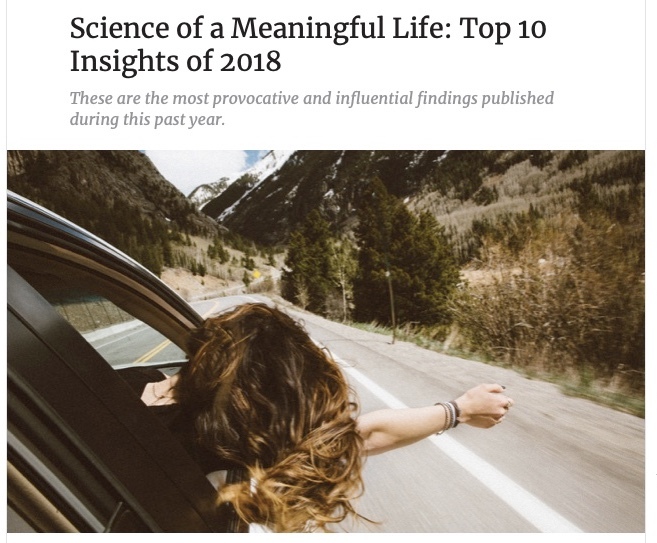 Of course, as these authors and researchers would no doubt agree, the processes of making and growing friendships are about much more than time and proximity. Shared experiences, values, and personality matches are just as important. Strong connections via the latter can create deep bonds in a relatively short amount of time. That said, as a baseline matter, the findings that close friendships may be easier to create when we are younger resonates with me. Especially compared to college, law school, and my early years of legal practice as a Legal Aid lawyer, making new, close friendships as I entered into my mid-30s proved to be a challenge. It didn’t help that during that time, I had uprooted myself from New York City (my dearly adopted home of 12 years) to Boston to take a law school teaching job. Now, Boston is a beautiful city with many positive qualities, but in keeping with the town’s long-held reputation for parochialism, the locals weren’t exactly rolling out the Welcome Wagon for newcomers like me. And I just happened to be joining an institution that embodied a lot of that insularity. Those early years in Boston were awfully lonely. During the past decade or so, however, I have found that making new friends is easier. 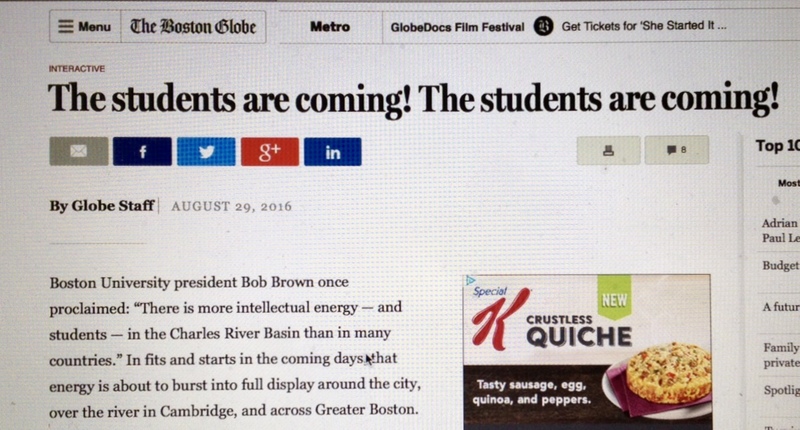 They live in the Boston area, elsewhere in the U.S., and around the world. It took me until well into my 50s to get to this place. In particular, I have discovered, and in some instances helped to create, multiple communities of good, grounded people — tribes, if you will — that have fostered genuine friendships, while strengthening many friendships of longer vintage. During this time, and fueled by these good people, I have grown as a person. It’s worth our time and effort to pay attention to friendships, because we are also in the midst of what many observers and researchers are calling an epidemic of loneliness, especially among those later in life. (Just search “loneliness epidemic” and you’ll see what I mean.) The presence or absence of good friendships in our lives is not the only major factor in determining loneliness, but it’s a big part of the equation. And if we add to the mix the challenges of forging new friendships as we get older, then the findings about loneliness and aging present yet another dimension: One of the obvious antidotes to loneliness — creating new, genuine friendships — does not come as easily as we age. So, while it’s hardly a quick fix, we benefit individually and collectively by valuing friendships and the care and feeding of friendships. Individual tastes and preferences may vary, and I’ll toss in the introvert vs. extrovert factor as well when it comes to the role that friendships play in our lives. But suffice it to say that having good friends in our lives is part of living well and healthy. 1. To make and keep a good friend, you have to be a good friend. People may differ on what being a good friend means, but a good friendship goes both ways under any definition. 2. Especially when one friend is in great need, a supreme test of that friendship is how the other responds. A great friendship survives, perhaps even grows out of, this adversity. 3. Older friendships may ripen and mature. Shared memories from back in the day can be great (those old stories are the best, aren’t they? ), but those friendships may deepen beyond the snapshots of days gone by — and ideally they will do so. 4. Shared, immersed interests and experiences are a great source of new friendships in adulthood. They can create positive, supportive, and lasting emotional connections. 5. Friendships can come from anywhere, including online interactions. For example, I find that Facebook at middle age has proven to be a source of genuine connections with folks from many different walks of life. Online communications are also a great way of maintaining and growing existing friendships separated by distance. 6. A diversity of friends makes our lives richer. I don’t mean diversity in so-called politically correct terms, but rather friends drawn naturally from different walks of life. 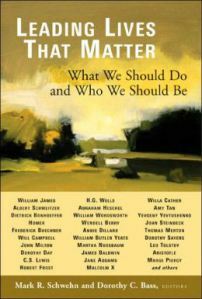 For me, shared core values are important, but this still leaves abundant room for differences in lifestyles, ages/generations, political and social beliefs, and overall backgrounds. 7. Family members can become friends, and friends can become extended family members. It’s the quality of the relationship that matters, not necessarily bloodlines. 8. Love in many different manifestations can be a by-product of friendship. This includes familial, romantic, or simply a bond that deepens. 9. Friendships can form out of positive experiences, shared challenges, or adversity. What counts is the character of the relationships. 10. Friendships, like any other relationship, are not necessarily forever. People change, stuff happens. Search “ending a friendship” and you’ll see that a lot of people have thought about this. 11. That said, some friendships are forever. We should treasure them. Getting older is a mixed bag, but one of the best things about it is calling people your lifelong friends and knowing that it’s true. 13. In terms of our closer friendships, it’s mostly about quality, not quantity. If we’re fortunate, that circle can be a source of mutual fellowship and support over the long haul. 14. Shared values can matter to a lot of us in maintaining friendships. I don’t mean that we all need to agree on everything. Rather, I’m referring to core values about life and how we should treat one another. Given my frequent bouts of nostalgia, I thought I’d delve way back into my boyhood to trace how this has been a natural state of affairs for me. Indeed, while we often associate nostalgia with memories of people, events, and experiences of long ago, I recall having these feelings as early as my grade school years. In fact, my original bouts of nostalgia were grounded in family trips to see relatives in Hawaii, when my brother Jeff and I were very young. These visits occurred every few years, and they created lasting memories. When one of the local Chicago area TV stations would run episodes of “Hawaii Calls,” a syndicated travel program that included many of the touristy Hawaiian songs we learned during our visits, I would find myself holding back tears over memories of our own travels to the Aloha State — memories that may have been only a year old! By the time I entered my teen years, and proceeding into my college days, nostalgia was a natural, common state for me. During those years I also discovered my penchant for historical nostalgia, that is, feeling a very emotional connection to defined stretches of the past that preceded my arrival. 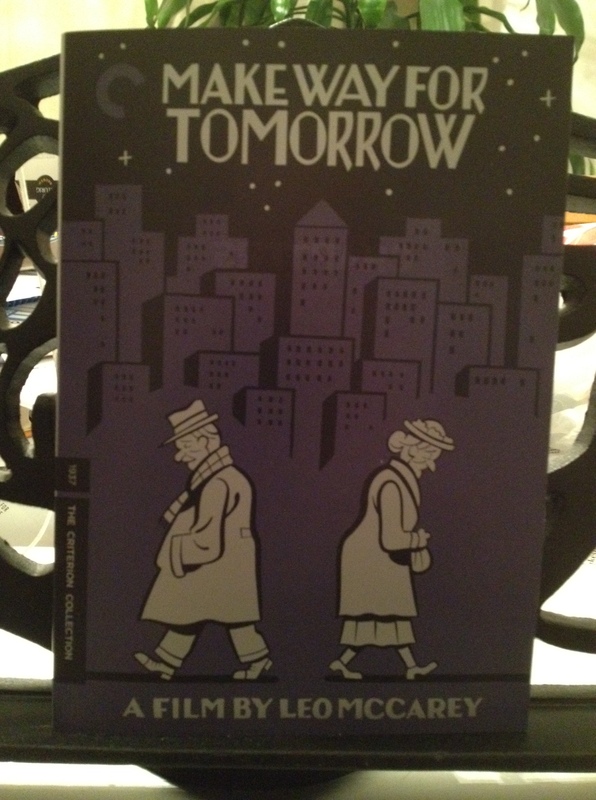 America’s “Roaring Twenties” constituted the first such period to capture my fascination. No doubt that my enjoyment of history is fueled by this energetic tie. As I alluded to above, like many, I associate memories with music. My nostalgic episodes, real and historic, typically have strong musical connections. It’s appropriate that I would link in this post a couple of classics from Don Ho, one of the iconic performers of popular Hawaiian songs. Both were favorites during our visits to Hawaii many years ago. I made an extended weekend trip to northwest Indiana for a long overdue visit with friends and family, one filled with both nostalgia for the past and appreciation for enduring friendships renewed. Concededly, I am positively masochistic when it comes to self-inflicted nostalgia. During much of this trip, I had my rental car radio tuned to an oldies station that played songs mostly from the late 70s through early 80s. Like many, I associate old Top 40 songs with memories of earlier days, so I basically had a series of mental videos going through my head, prompted by whatever was on the air. I put the nostalgia machine on overdrive when I had some time to kill before heading off to O’Hare Airport. I decided to spend a few hours driving around to old haunts. Here’s our early boyhood home in Grffith, Indiana. When our family moved to the neighboring city of Hammond, our aunt, uncle, and cousins moved from Ohio to Griffith to take our place in this home! It started with a visit to our early boyhood home in small-town Griffith, Indiana, where my brother Jeff and I spent our early years with our parents. I had not been there in many decades. I was stunned to see a cozy little block with a narrow street. In my memories of being five years old, it is a big, humongous block with a wide street! I also stopped at the Hammond, Indiana house that was home for most of my childhood through teen years. No real surprises there…it and the surrounding homes were much more as I had remembered them. 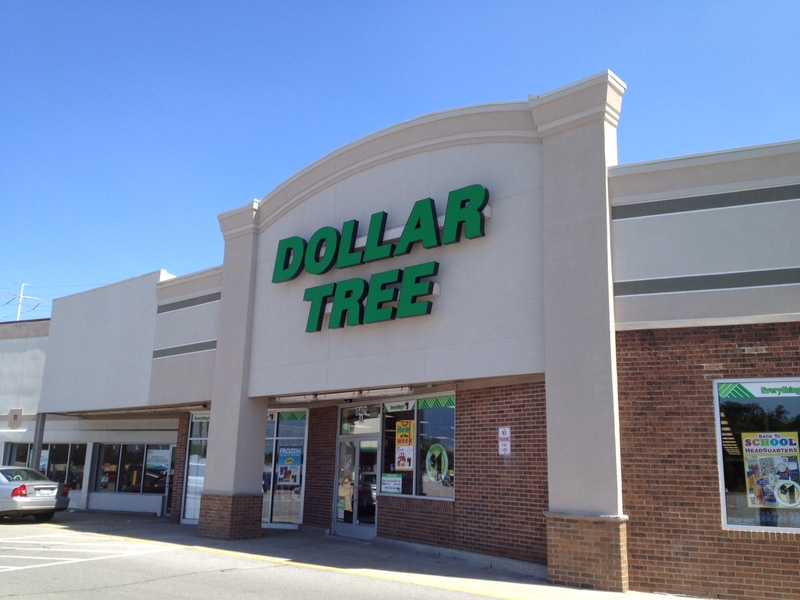 Now a Dollar Store in Highland, Indiana, this was the site of the warehouse-style outlet of the drugstore chain I worked for during an interim year between college and law school. For some odd reason I wanted to revisit the sites of jobs I had worked before moving to New York for law school in 1982. During several college summers and holiday periods, as well as an interim year between finishing college and leaving for law school, I worked for Ribordy Drugs, a local drugstore chain that once had a couple of dozen stores dotting northwest Indiana. It was standard low-paid retail store work, unloading delivery trucks, tagging merchandise, and stocking shelves. Although I grumbled about it at times, I now look back and realize that those experiences helped me to develop a work ethic. When I graduated from Valparaiso in 1981, I intended to take an interim year before moving on to law school. Alas, so-called “professional” jobs were not in large supply for new graduates in recession-burdened Northwest Indiana. So I ended up returning to Ribordy Drugs, this time working at its new warehouse-style store, a local precursor of the big box chain stores that now dominate the retail outlets in the area. I worked there more-or-less full-time, while also doing some part-time reporting for a local community newspaper. It was not the most exciting year of my life, but because I was filing my law school applications, it was filled with anticipation. My original plan was to head to the west coast, but when an acceptance letter from New York University arrived in the mail, I knew that I wanted to go there. 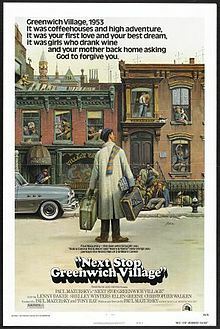 In August 1982, I would leave for NYU and the Big Apple. But let me get back to people. 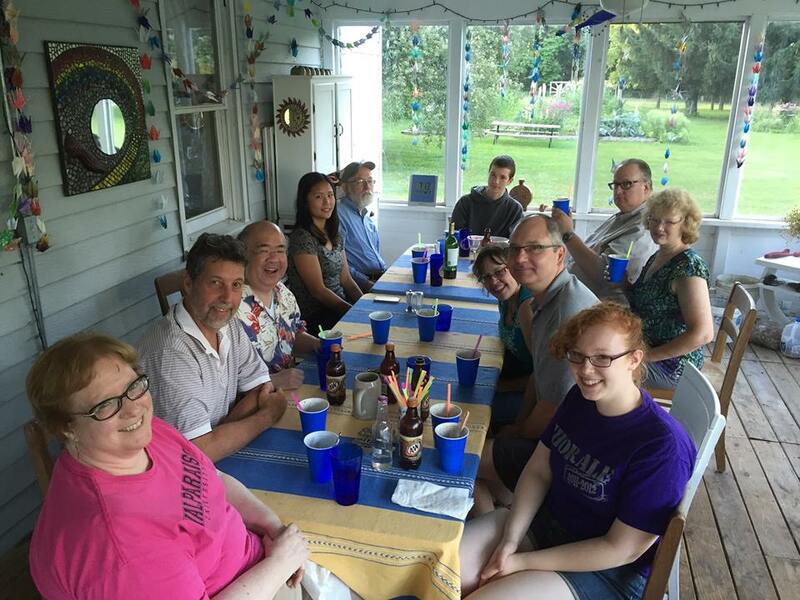 The photo above is from a mini-reunion last Friday of college friends from Valparaiso University and assorted family members. The company of Hilda, Mark, Brad, Don, Maggie, Dave, Dorothy, Jim, Elena, Abby, and Matt made for a most enjoyable evening. The many smiling faces in the photo were more than snapshot poses. 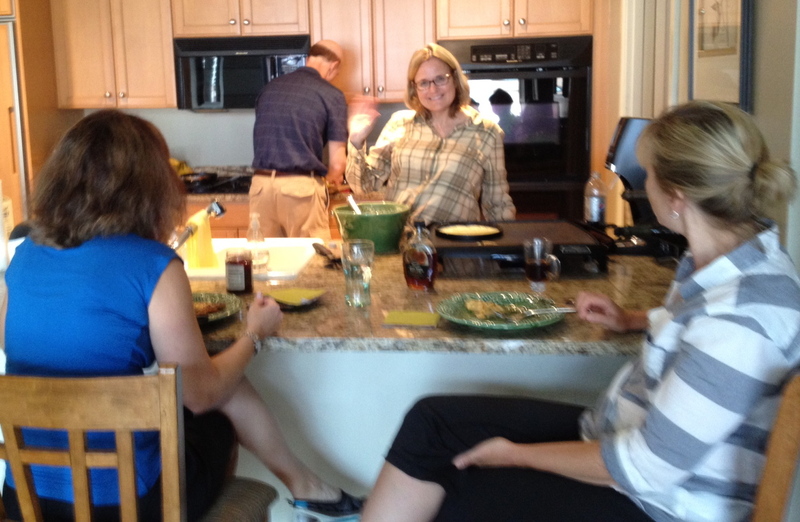 We were laughing a lot, unearthing stories from back in the day and sharing news of the latest goings-on in our lives. At my motel, I also bumped into another group of VU alums holding their own little reunion, including friends Sheralynn (and a most articulate contributor to a running e-mail exchange about the suspense series 24 when it aired) and Rachelle (fellow study abroad participant). Their sorority was doing a kind of Chicagoland summer reunion caravan that concluded with a visit to their alma mater. Getting to see them was an unexpected treat. 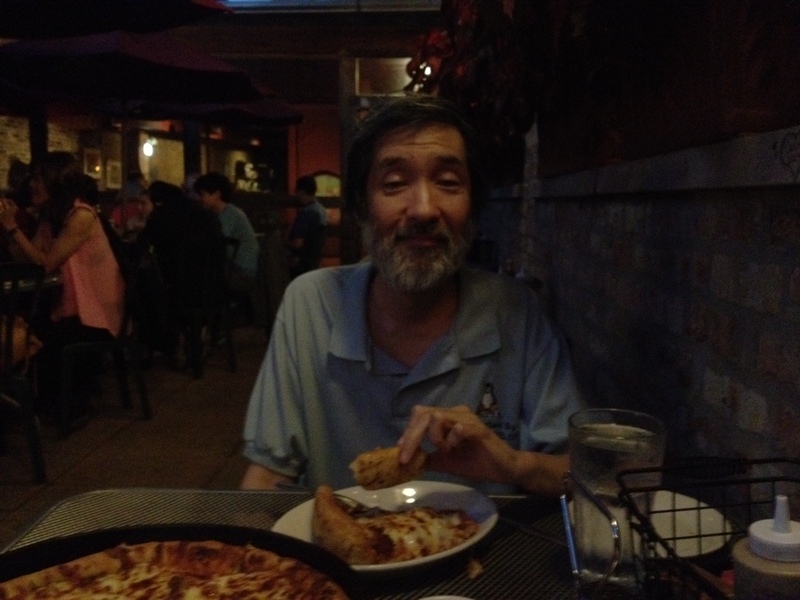 The next day, I drove to Hammond, where I joined with my brother Jeff and old friends Mark and Karen for a meal at the House of Pizza, a restaurant than enjoys legendary status for its uniquely excellent thin crust pizza. Mark and I have been friends going waaaay back to the 3rd grade. And all four of us have been going to House of Pizza since we were kids. Sharing a meal at one of Chicagoland’s many superb pizza places has become a sort of tradition during visits there. So here’s the lesson, especially for us nostalgia freaks: Old haunts are what they are, places of days gone by. It may be meaningful to revisit them, but they are of the past. When it comes to people, however, it’s about the present. The relationships built over the years may have their roots in long ago, but when they remain vibrant, and thankfully stripped of our my early immaturities (er, at least some of them), that is a pretty cool thing. As I’ve mentioned here before, I grew up in the northwest Indiana city of Hammond, a small (est. pop. 100,000) working class city. 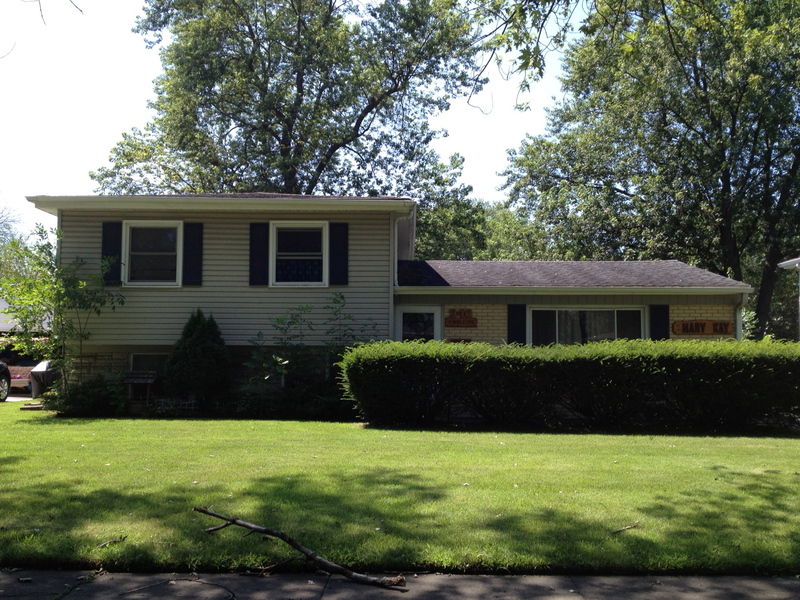 We lived in a neighborhood known as Woodmar, which had something of a suburban look and feel. During the 60s and early 70s, it was a relatively safe and secure place to grow up. Parents didn’t have to worry too much about kids being out on their own, even during the early evening hours. During grade school, a good bicycle was the primary means of attaining a degree of youthful independence, at least when it came to getting around the neighborhood on your own and meeting up with friends. 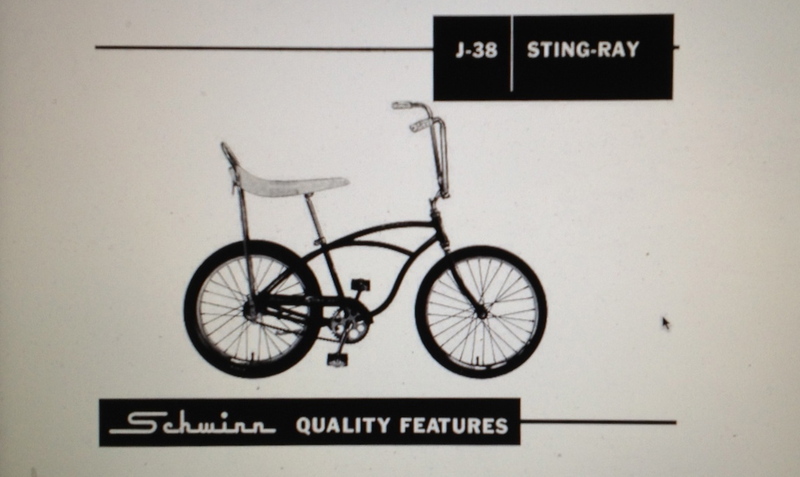 Among the many brands available, the basic, one speed Schwinn Sting-ray was a popular choice. It was simple, sturdy, and easy to control. A big step beyond a child’s starter bike, it could move pretty fast when powered by an energetic grade schooler. For me, the Sting-ray was my ticket to exploring the neighborhood beyond our immediate block. I could ride to friends’ homes, the parkway, our grade school, or even the shopping center. The bike had enough giddy up in it that in some areas I could ride (carefully) on the streets, rather than sticking exclusively to the sidewalks. I’ll stop short of trying to paint this as an idyllic childhood, because I was bored at times and felt lonely on occasion as well. Part of me yearned for something more, even if I didn’t know quite what it might look like back then. But such feelings are hardly unique among kids (or adults, for that matter). Overall I am fortunate to have happy memories of hopping on my bike to ride around the neighborhood. 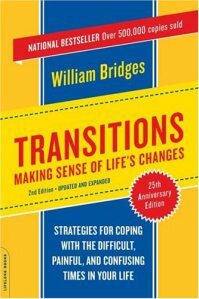 Ch-ch-ch-changes: Some books to guide toward good transitions (2012) — As we turn the calendar to a New Year, I wanted to gather together some recommended titles for those who are engaged in or contemplating a major work or personal transition….If you’re in the midst of big changes, these books may prove a worthy investment in terms of your livelihood and well-being. I hope you find them helpful. Over the years I have come to especially enjoy short trips to visit friends and family. These brief sojourns often turn out to be pauses that refresh, wonderful little mini-vacations. Such was the case over the weekend with a quick trip to Chicago. On Friday, however, it appeared that this particular visit might never get off the ground. An unhappy worker allegedly set fire to the Air Traffic Control Center near O’Hare Airport, crippling the nation’s passenger aviation system. After my flight was cancelled, I was able to grab the last seat on the only JetBlue flight going from Boston to Chicago that day, arriving late at night. By Saturday morning I was at my friends Don and Sharon’s condo in downtown Chicago, enjoying breakfast with them, their youngest son Thomas (a newly minted Eagle Scout — congrats Thomas! ), and long-time friends Kathy and Rachelle. 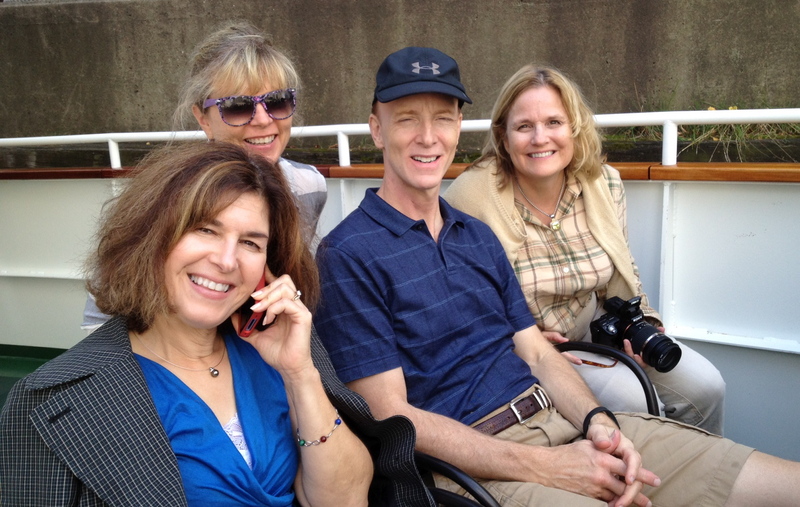 Don, Kathy, Rachelle, and I went to college together, including a memorable semester abroad in England, and Sharon has patiently endured our reminiscences for decades. 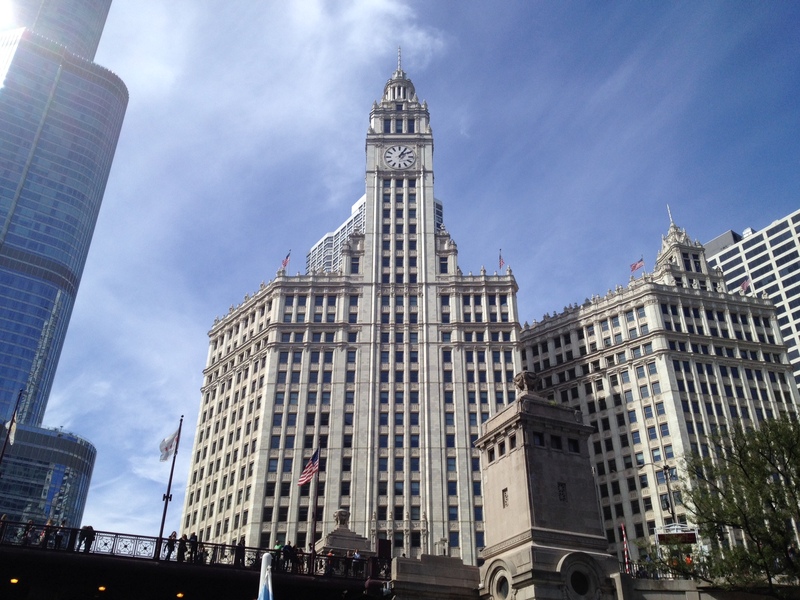 Properly fortified, we explored the downtown area, starting with a terrific boat tour on the Chicago River, replete with a very knowledgeable docent who shared stories about the city’s remarkable architecture. The tour featured lots of memorable vistas. Chicago has long been famous for its architectural history and variety, and over the past few decades its skyline has become truly spectacular. After more sightseeing, some shopping, and a lot of healthy walking, we finished our day with a fine dinner at a downtown restaurant. 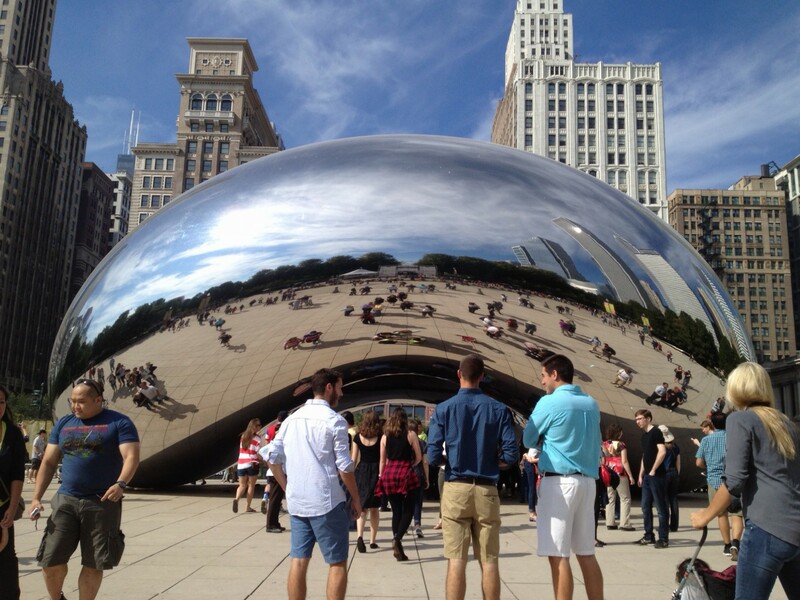 Sunday started with a short walk around Chicago’s Millennium Park, including a pitstop at the very cool bean sculpture. Our socializing concluded with a visit to a favorite childhood destination, Chicago’s Museum of Science and Industry. 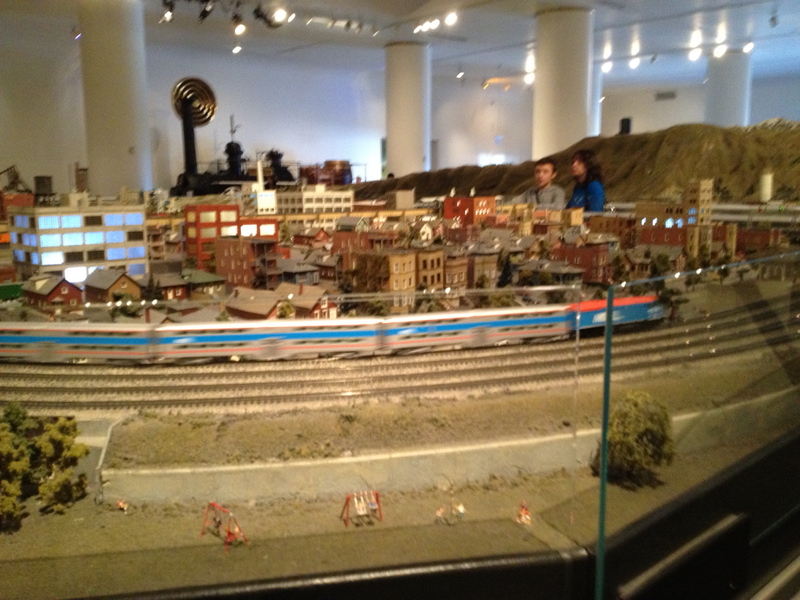 I was delighted to see that its famous model train display — my absolute favorite exhibit as a kid — had undergone a thorough upgrade. 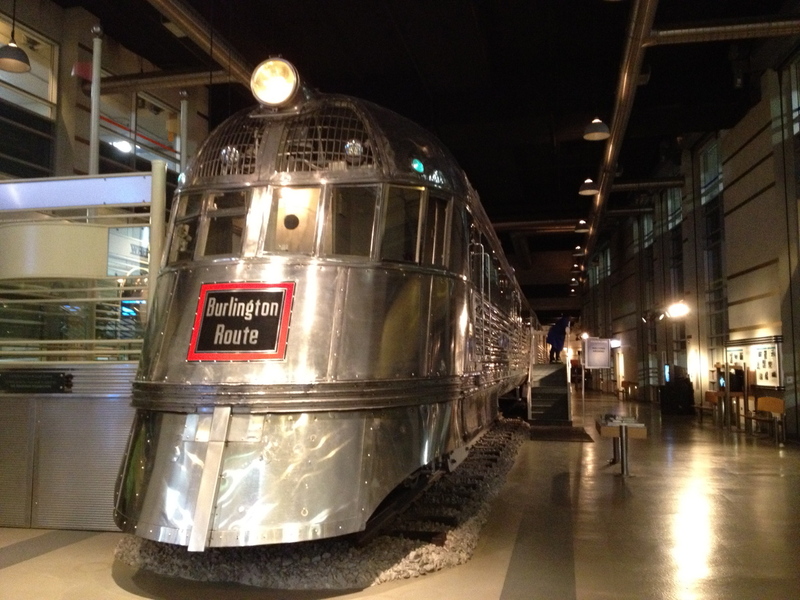 And speaking of trains, here’s the real deal, the famous Pioneer Zephyr, which during the 1930s epitomized modern train travel. 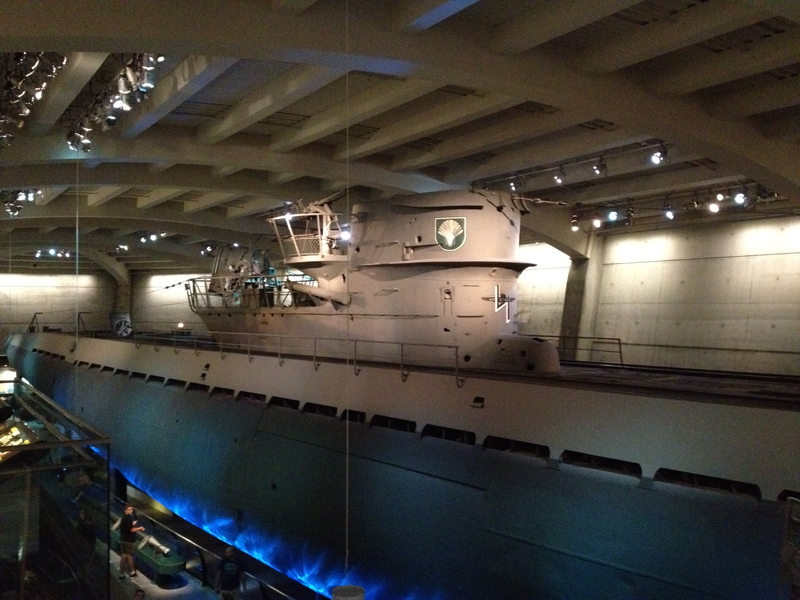 The history geek in me loved checking out the U-505, a German submarine captured by the Americans during the Second World War. There’s an exciting story behind its capture, which you can read about here. The WWII theme of our visit also included a very well done OmniMax film about D-Day. A side benefit of our museum visit was that I missed the Chicago Bears blowout loss to the Green Bay Packers at nearly Soldier Field. However, later that afternoon, a lot of Bears fans, dressed in their team jerseys, milled about the streets, looking understandably morose. For dinner, I met up with my brother Jeff, who lives in nearby Glen Ellyn, Illinois, for a deep dish pizza at Medici’s, a popular eatery in Chicago’s Hyde Park neighborhood. Jeff also happens to be a wizard at computers, and he gave me some good advice on how to upgrade my Internet security practices. The pizza was pretty excellent too. In addition to greatly enjoying the company of my friends and brother, what struck me was the way in which Chicago has become a world-class city, in its very own big and brawny sort of way. When I spent a summer there working for a large law firm in 1984 (here’s the story of that time! 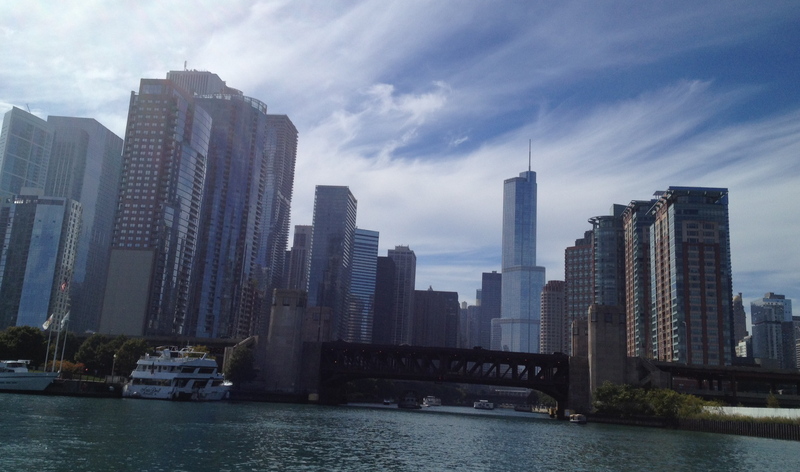 ), Chicago seemed old and tired. Today, although the city certainly faces its share of challenges, its downtown feels vibrant and alive. Throwback Thursday: Favorite childhood eateries? What are your favorite childhood eateries? Maybe a restaurant that served the best comfort foods? Or perhaps a place that was designated for special meals with your family? Growing up, Miner-Dunn was a favorite family destination. Once we got our driver’s licenses, it became an occasional nighttime or after game hangout as well. During my occasional visits back to Northwest Indiana, I’ve made pilgrimages there to enjoy the good food, which remains very reasonably priced to boot. 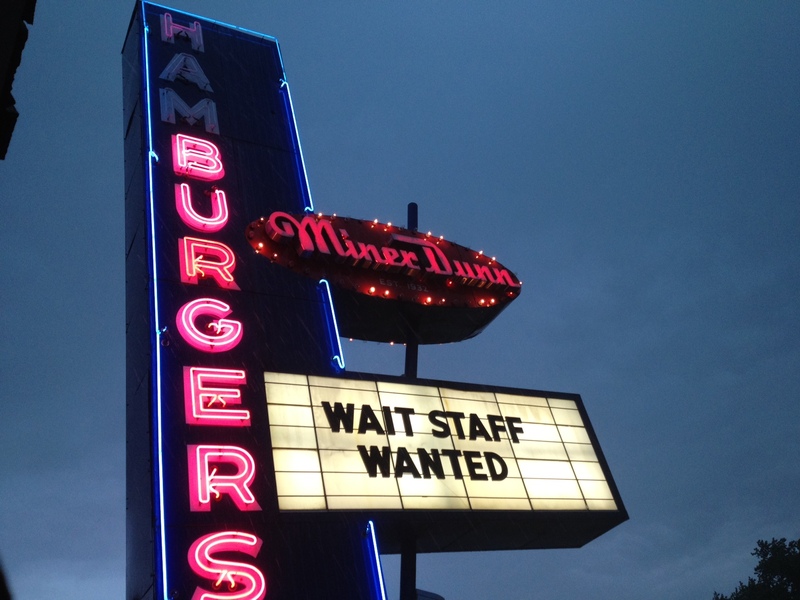 I also realized that I have posted photos of two favorite burger places going back to years past in successive posts. Talk about being a meathead.